With one of the deadliest years on record about to come to a close, a group of about three dozen community members are taking steps they hope will make Champaign-Urbana a less violent place to call home in 2019. A month after Champaign City Council members were briefed on disturbing gun violence statistics during an update on the C-U Fresh Start program — 109 shooting incidents and eight homicides in the two cities in the first 10 months of the year alone — another local initiative was launched over the weekend with a similar goal. 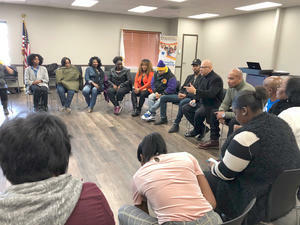 Community members were trained on becoming “violence interrupters” — the term used to describe those who detect conflicts before they intensify. One example: If a shooting has occurred, interrupters will reach out to the victim’s friends and relatives to try to prevent retaliation.